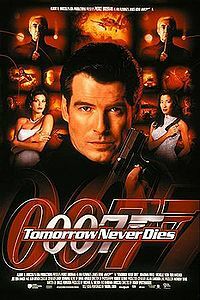 Tomorrow Never Dies (1997) is the 18th spy film in the James Bond series, and the second to star Pierce Brosnan as the fictional MI6 agent James Bond. Bruce Feirstein wrote the screenplay, and it was directed by Roger Spottiswoode. It follows Bond as he tries to stop a media mogul from engineering world events and starting World War III. The film was produced by Michael G. Wilson and Barbara Broccoli, and was the first James Bond film made after the death of producer Albert R. Broccoli. The movie paid tribute to him in the end credits. Tomorrow Never Dies performed well at the box office and earned a Golden Globe nomination despite mixed reviews. While its domestic box office surpassed GoldenEye, it was the only Pierce Brosnan Bond film not to open at number one at the box office since it opened the same day as Titanic.